Are Parents and Teachers Enemies? Today's parents and teachers reveal what they expect from each other, how and when they communicate, and how role construction, new family structures and conflict affect their relationships and roles. This book provides invaluable information and insight for creating and sustaining partnerships between home and school at the secondary level. In-depth interviews with parents and teachers along with analysis of the history and changes that have occurred through time in schools and families have resulted in a book that provides the necessary insight for successful partnership building. At a time when families and schools face more responsibility and blame than ever before - family/school and parent/teacher partnerships are of crucial importance. Models for conflict resolution and home/school partnerships are presented. Topics include, helicopter parents, ghosts in the classroom, knowing the same child, entitlement and teachers as parents. 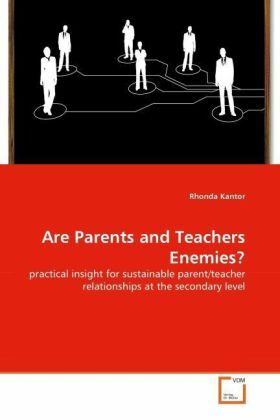 Bitte schreiben Sie uns Ihre Meinung zu: Are Parents and Teachers Enemies?